(Bloomberg) – Jacob Zuma is refusing to go away quietly. 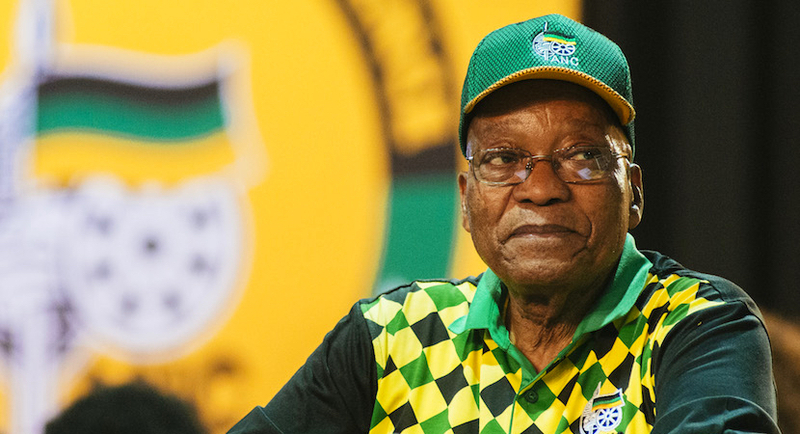 Pressured to resign as the nation’s president in February, Zuma retains significant influence in the ruling African National Congress, and his successor, Cyril Ramaphosa, has been forced to keep some of the former leader’s allies in the cabinet. That’s hampered the new president’s bid to unify the party, fight corruption and implement policies to restore confidence in the economy. “We have not been in this situation before where the former president starts organising against the incumbent while still a member of the party,” said Sithembile Mbete, a political science lecturer at the University of Pretoria. Ramaphosa, 65, faces a mountain of other problems, ranging from a sagging economy, massive unemployment and a long judicial process to eliminate “state capture,” the local term for allegations that the Gupta family, who are friends of Zuma, engaged in illicit business with state companies. 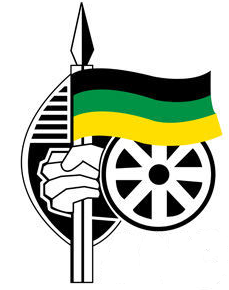 At the same time, he must lead the ANC into elections next year in the first vote since the opposition won control of several key municipalities, including Johannesburg and the capital, Pretoria, in 2016. Investor and business confidence climbed after Ramaphosa’s rise to power. He acted quickly to start a cleanup of state companies and rid the administration of ineffectual ministers. The country then secured its last-remaining investment-grade status from Moody’s Investors Service. Cyril Spring. 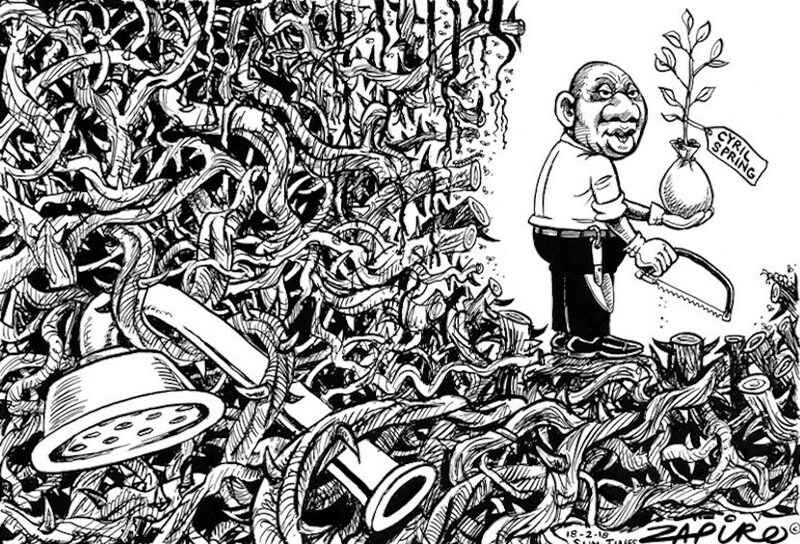 More cartoon magic available at www.zapiro.com. But the initial euphoria has ebbed as global risks mount. After rallying to a three-year high against the dollar, the rand has lost ground as emerging-market assets face headwinds including rising U.S. rates, trade tensions and crises in economies from Argentina to Turkey. At the same time, Ramaphosa must deal with an NEC that still has plenty of Zuma allies and the party’s top six group with a couple of the former president’s supporters, including Secretary-General Ace Magashule. 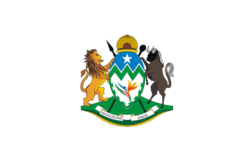 Attending the graft hearing in support of Zuma were Sihle Zikalala, the ANC’s provincial leader in the eastern KwaZulu-Natal province, and Supra Mahumapelo, the party chairman in the North West region who was forced to resign as regional premier after violent protests against his leadership. “In many ways former president Zuma is at the heart of this counter-revolutionary fight-back, together with a circle of discredited individuals, many themselves facing the likelihood of criminal prosecution,” Blade Nzimande, the secretary-general of the ANC-allied Communist Party who is also Transport Minister in the cabinet, said last month. In the end, Ramaphosa will eventually weaken the backbone of Zuma’s support, according to analysts such as Mcebisi Ndletyana, a political science professor at the University of Johannesburg. It’s in KwaZulu-Natal, the province with the most ANC members, where Zuma’s enduring support runs deepest. The province was split at the ANC’s elective conference in December when Ramaphosa beat Zuma’s preferred candidate and ex-wife, Nkosazana Dlamini-Zuma, in a tight vote for party president. “He sees KwaZulu-Natal as the strategic center to challenge the leadership of the ANC and remind Ramaphosa that he won by a very, very narrow margin in December and that he is not very hegemonic in ANC,” Mathekga said. As a result, the continued power struggle inside the party has constrained Ramaphosa’s room for maneuver. “The ANC is in a permanent state of crisis, or a permanent state of damage control, a situation you do not want to be a year before an election,” political science lecturer Mbete said.